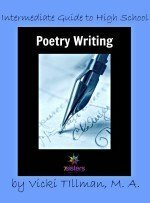 For the homeschooler with a little poetry writing experience, Intermediate Guide to High School Poetry Writing is an enjoyable way to introduce your homeschooler to the power and fun of words. Creativity is waiting to be uncovered with 7Sisters poetry writing high school curriculum! This 45-page downloadable pdf workbook by Vicki Tillman, is easy to use so a student could follow the process even if he or she does not have a teacher who is experienced in writing poetry.The guide is written to be used over a six-week period. This e-text is written in a friendly manner, conversational in tone, and can be used independently or with a co-op. Click here to view an excerpt from Intermediate Guide to High School Poetry Writing. Poetry Writing high school curriculum from 7 Sisters !